Structure is what allows something to endure. That is probably why the word is equally useful for buildings or ideas: in the former, structure is what allows them to stand upright while in the latter is that which allows organizing the arguments. However, there are examples - such as those on this selection - where both notions go hand in hand: when an idea on structure is materialized in a physical construction. ARQ’s index makes evident the place where the magazine is produced: a country of recent buildings and fragile material culture, whose main asset has been geography. We can understand ARQ as a civilizing effort, a magazine where the city - the place of civility - has been thought of as an architectural desire in its purest form, an idea of civilization underlying any commission. Its index is full of attempts to describe a primitive hut, an artificial structure suitable for civilized life. 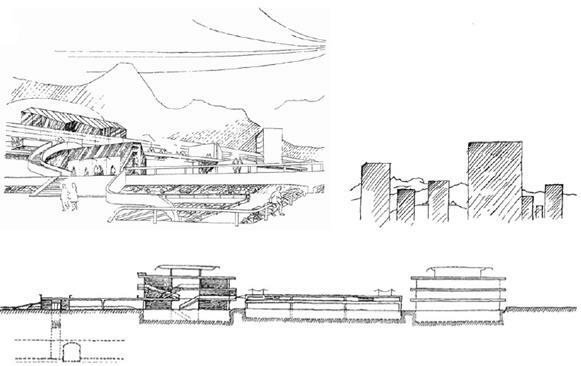 Instead of devising architecture’s primeval moment, the following selection seeks to show architectural structures that involve ideas on the city. In architecture, the word ‘structure’ is understood in several ways. At the Hut in Chiloé (ARQ 39) is both a system to transfer the building’s weight to the ground and a reference framework for understanding reality; is both a mental order linking the different parts of the project and a device to compare the objects that populate a particular inner world. The structure, in this case, allows consolidating an autonomous interior universe as a bubble detached from its exterior, although visible through it. At the Matta Viel Complex (ARQ 42), on the other hand, multiple intimacies coexist. What these intimacies have in common is solved by the general layout. Their differences are arbitrated by the details. A comb-shaped parti promotes the advantages of collective life, opening to a park while consolidating the edges of the rest of the block. 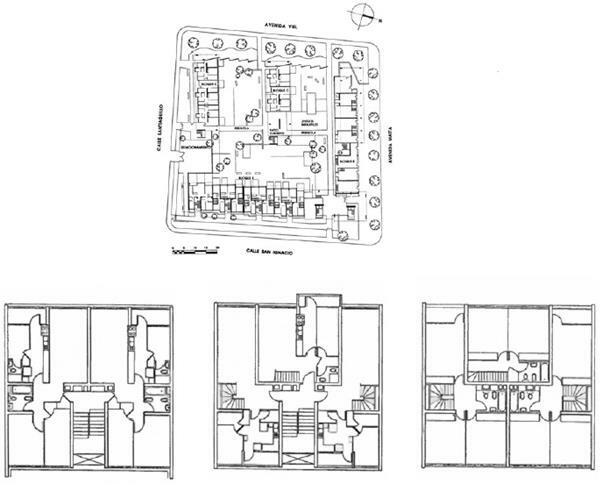 Then, a series of thresholds - between blind and window, between apartment and corridor, between the blocks and the street, between one step and another - give the units privacy, emphasizing the individuality of each element wherever is required. The city is structured in the confluence of external and internal, public and private forces. The administration of the house (formerly called oikonomia) and the debate on public affairs (politics) are acts of governance, but they also occur in a place. The section of the building Cruz del Sur (ARQ 73) shows this dichotomy. The size reduction in its lower level improves the ratio of the civil registry’s accesses courtyard, while the increased area for the upper levels provides more square meters right where they are valued the most. The delimitation of public and private space is beneficial for both. Now, seeing the building from a distance behind an elevated avenue stresses the value of the upper floors rather than the square below it. If Cruz del Sur is a private building with a public use, ECLAC headquarters (ARQ 24) is a public building with a restricted use. Its layout around a central courtyard generates a particular relationship with the surrounding land. A large central void assembles an array of finished and different pieces into a single institution. Grouping the various programs inside a centralized structure means delimiting a nucleus separated from the outside. By suspending the ring surrounding the courtyard, ECLAC manages to frame the sky while opening the ground level to multiple accesses. The subversion of traditional typologies - such as the ziggurat, the block or the patio - allows resolving the relationship between parts and the city without compromising the composition’s integrity. If ECLAC deploys the compositional crossroads faced by an institution with a centralized plan in a free society, the East Center (ARQ 40) identifies the multiple variables and programs encompassed in a center. Commerce, streets, parking lots, parks, and public institutions are organized considering not only the city’s pre-existing layouts but also the geographical dimension of the mountain range. In a polycentric, suburban city, the presence of geography is unavoidable. The shape and location of new buildings in the territory depend to a large extent on the infrastructure networks that serve them. 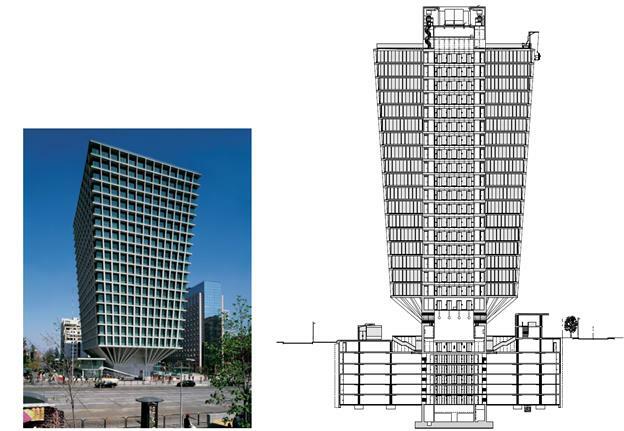 How to think in architectural terms this set of systems designed precisely to serve a structure ‘from below,’ without accusing its presence? 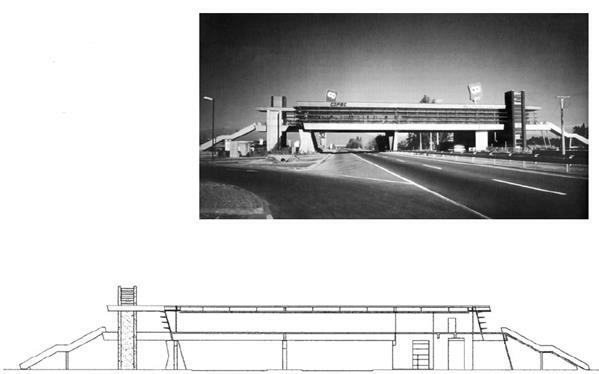 The restaurant over the Del Sol Highway (ARQ 45) takes the elements of infrastructural constructions - beams and pillars whose formal order is given by the width of the road and expansion joints - as ‘found objects’ that re-signify their usual understanding through a new use (eating and warning the presence of a gas station) rather than a new form. While infrastructural connections blur the difference between nature and artifice, natural landscapes have increasingly acquired a monumental condition. The Waterloo Epic Theater (ARQ 18), instead of hiding human intervention while pretending to be in the wild, monumentalizes the possibilities of artificial landscape. Trees and topographies are not seen as available for technical manipulation, but as devices of cultural significance that evoke collective memories. In landscape architecture, the relevance of pre-existing conditions usually suggests an empirical approach to design, skeptical of general decisions. 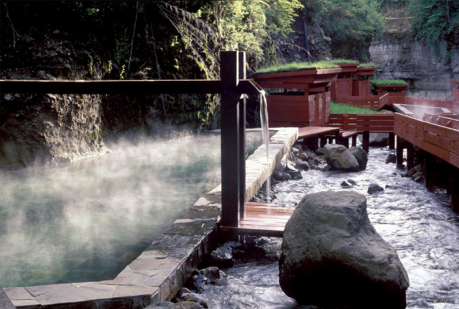 The number and position of the elements that built up the Geometric Hot Springs (ARQ 65) are explained by a strategy regarding the site rather than a finished composition. Now, to a large extent, its exuberant experience can be referred to a single idea: circulating on the river, not by the river. This is not an architecture ‘of sensations’ nor ‘of ideas,’ but one of intentions that runs through the project in its multiple dimensions. The difference between strategy and composition refers to the way a project is approached, not to the scope of its results. 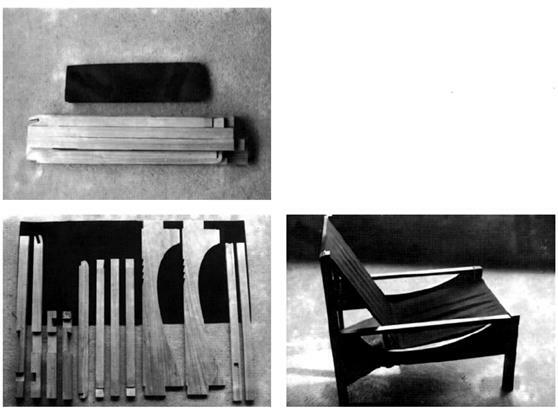 If the Hot Springs are ordered according to a strategy, the Puzzle chair (ARQ 8) follows a composition. In it, nothing can be altered, as each part needs the other. Its structural system is perfected when its purpose is fulfilled - its rigidity increases when sitting on it. The structure’s value is intensified in its use. Use, then, depends on a cultural notion of value. Without it, we have no way of assessing the legitimacy of our architectural purposes. The difficulty in thinking the city today reflects the crisis of the very concept of civility - that cultural construction that allows public deliberation. Nautilus (ARQ 46) showed what happens when domestic administration becomes public debate. Thinking the city begins by thinking how we show ourselves to the world. Figure 1 La Habitación. Smiljan Radić, 1992-1997. Figure 2 Conjunto Matta Viel. Bresciani, Valdés, Castillo, Huidobro, 1956. Figure 3 Edificio CEPAL. Emilio Duhart y asociados, 1960. Figure 4 Edificio Cruz del Sur. Luis Izquierdo, Antonia Lehmann, 2009. Figure 5 Centro Oriente. Corporación de Mejoramiento Urbano CORMU, Miguel Eyquem, Arturo Baeza, 1970-1974. Figure 6 El teatro épico: monumento a la batalla de Waterloo, Rodrigo Pérez de Arce, Alan Gordon Morris, 1991. 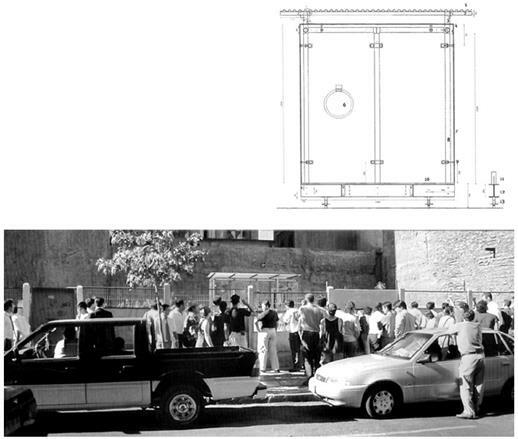 Figure 7 Restaurante sobre la Autopista del Sol, Juan Sabbagh, Mariana Sabbagh, Julio Aguirre, 1999. Figure 8 Termas Geométricas, Germán del Sol, 2003. Figure 9 Silla Puzzle, Juan Ignacio Baixas, 1983. 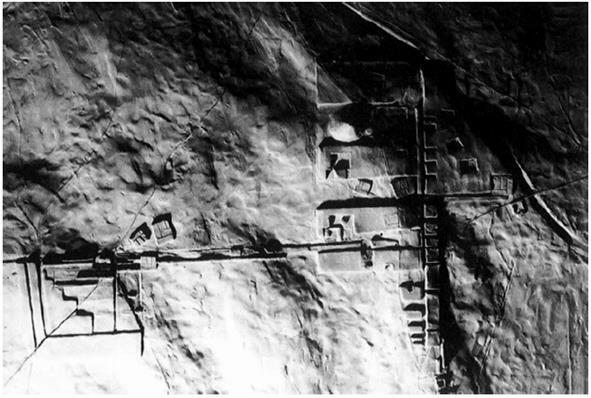 Figure 10 Nautilus, la casa de vidrio, Arturo Torres, Jorge Christie, 2000. Architect, Pontificia Universidad Católica de Chile, 2009. MSc Advanced Architectural Design, Columbia University, 2014. He received the Honor Award for Excellence in Design and the Lucille Smyser Lowenfish Memorial Prize. Works independently since 2010. In 2012 he joined as partner in Izquierdo Lehmann architects. His projects have been published and exhibited in Chile and abroad, including the MoMA in New York (Young Architect Program, 2015) and the exhibition “Extra-Ordinary” at CFA New York (2016). In 2015, his Futrono House project was awarded in the xix Bienal de Arquitectura de Chile. He currently serves as a professor at the Pontificia Universidad Católica de Chile.